The Notch signaling pathway is a highly conserved cell signaling system present in most multicellular organisms. Mammals possess four different notch receptors, referred to as NOTCH1, NOTCH2, NOTCH3, and NOTCH4. The notch receptor is a single-pass transmembrane receptor protein. It is a hetero-oligomer composed of a large extracellular portion, which associates in a calcium-dependent, non-covalent interaction with a smaller piece of the notch protein composed of a short extracellular region, a single transmembrane-pass, and a small intracellular region. In 1914, John S. Dexter noticed the appearance of a notch in the wings of the fruit fly Drosophila melanogaster. The alleles of the gene were identified in 1917 by Thomas Hunt Morgan. Its molecular analysis and sequencing was independently undertaken in the 1980s by Spyros Artavanis-Tsakonas and Michael W. Young. Alleles of the two C. elegans Notch genes were identified based on developmental phenotypes: lin-12 and glp-1. The cloning and partial sequence of lin-12 was reported at the same time as Drosophila Notch by Iva Greenwald. The Notch protein spans the cell membrane, with part of it inside and part outside. Ligand proteins binding to the extracellular domain induce proteolytic cleavage and release of the intracellular domain, which enters the cell nucleus to modify gene expression. The cleavage model was first proposed in 1993 based on work done with Drosophila Notch and C. elegans lin-12, informed by the first oncogenic mutation affecting a human Notch gene. Compelling evidence for this model was provided in 1998 by in vivo analysis in Drosophila by Gary Struhl and in cell culture by Raphael Kopan. Although this model was initially disputed, the evidence in favor of the model was irrefutable by 2001. The receptor is normally triggered via direct cell-to-cell contact, in which the transmembrane proteins of the cells in direct contact form the ligands that bind the notch receptor. The Notch binding allows groups of cells to organize themselves such that, if one cell expresses a given trait, this may be switched off in neighbouring cells by the intercellular notch signal. In this way, groups of cells influence one another to make large structures. Thus, lateral inhibition mechanisms are key to Notch signaling. lin-12 and Notch mediate binary cell fate decisions, and lateral inhibition involves feedback mechanisms to amplify initial differences. The Notch cascade consists of Notch and Notch ligands, as well as intracellular proteins transmitting the notch signal to the cell's nucleus. The Notch/Lin-12/Glp-1 receptor family was found to be involved in the specification of cell fates during development in Drosophila and C. elegans. The intracellular domain of Notch forms a complex with CBF1 and Mastermind to activate transcription of target genes. The structure of the complex has been determined. Notch signaling is dysregulated in many cancers, and faulty notch signaling is implicated in many diseases including T-ALL (T-cell acute lymphoblastic leukemia), CADASIL (Cerebral Autosomal-Dominant Arteriopathy with Sub-cortical Infarcts and Leukoencephalopathy), Multiple Sclerosis (MS), Tetralogy of Fallot, Alagille syndrome, and many other disease states. Inhibition of notch signaling has been shown to have anti-proliferative effects on T-cell acute lymphoblastic leukemia in cultured cells and in a mouse model. It has also been found that Rex1 has inhibitory effects on the expression of notch in mesenchymal stem cells, preventing differentiation. Maturation of the notch receptor involves cleavage at the prospective extracellular side during intracellular trafficking in the Golgi complex. This results in a bipartite protein, composed of a large extracellular domain linked to the smaller transmembrane and intracellular domain. Binding of ligand promotes two proteolytic processing events; as a result of proteolysis, the intracellular domain is liberated and can enter the nucleus to engage other DNA-binding proteins and regulate gene expression. Notch and most of its ligands are transmembrane proteins, so the cells expressing the ligands typically must be adjacent to the notch expressing cell for signaling to occur. The notch ligands are also single-pass transmembrane proteins and are members of the DSL (Delta/Serrate/LAG-2) family of proteins. In Drosophila melanogaster (the fruit fly), there are two ligands named Delta and Serrate. In mammals, the corresponding names are Delta-like and Jagged. In mammals there are multiple Delta-like and Jagged ligands, as well as possibly a variety of other ligands, such as F3/contactin. In the nematode C. elegans, two genes encode homologous proteins, glp-1 and lin-12. There has been at least one report that suggests that some cells can send out processes that allow signaling to occur between cells that are as much as four or five cell diameters apart. The notch extracellular domain is composed primarily of small cystine-rich motifs called EGF-like repeats. Notch 1, for example, has 36 of these repeats. Each EGF-like repeat is composed of approximately 40 amino acids, and its structure is defined largely by six conserved cysteine residues that form three conserved disulfide bonds. Each EGF-like repeat can be modified by O-linked glycans at specific sites. An O-glucose sugar may be added between the first and second conserved cysteines, and an O-fucose may be added between the second and third conserved cysteines. These sugars are added by an as-yet-unidentified O-glucosyltransferase (except for Rumi), and GDP-fucose Protein O-fucosyltransferase 1 (POFUT1), respectively. The addition of O-fucose by POFUT1 is absolutely necessary for notch function, and, without the enzyme to add O-fucose, all notch proteins fail to function properly. As yet, the manner by which the glycosylation of notch affects function is not completely understood. The O-glucose on notch can be further elongated to a trisaccharide with the addition of two xylose sugars by xylosyltransferases, and the O-fucose can be elongated to a tetrasaccharide by the ordered addition of an N-acetylglucosamine (GlcNAc) sugar by an N-Acetylglucosaminyltransferase called Fringe, the addition of a galactose by a galactosyltransferase, and the addition of a sialic acid by a sialyltransferase. To add another level of complexity, in mammals there are three Fringe GlcNAc-transferases, named lunatic fringe, manic fringe, and radical fringe. These enzymes are responsible for something called a "fringe effect" on notch signaling. If Fringe adds a GlcNAc to the O-fucose sugar then the subsequent addition of a galactose and sialic acid will occur. In the presence of this tetrasaccharide, notch signals strongly when it interacts with the Delta ligand, but has markedly inhibited signaling when interacting with the Jagged ligand. The means by which this addition of sugar inhibits signaling through one ligand, and potentiates signaling through another is not clearly understood. Once the notch extracellular domain interacts with a ligand, an ADAM-family metalloprotease called ADAM10, cleaves the notch protein just outside the membrane. This releases the extracellular portion of notch (NECD), which continues to interact with the ligand. The ligand plus the notch extracellular domain is then endocytosed by the ligand-expressing cell. There may be signaling effects in the ligand-expressing cell after endocytosis; this part of notch signaling is a topic of active research. After this first cleavage, an enzyme called γ-secretase (which is implicated in Alzheimer's disease) cleaves the remaining part of the notch protein just inside the inner leaflet of the cell membrane of the notch-expressing cell. This releases the intracellular domain of the notch protein (NICD), which then moves to the nucleus, where it can regulate gene expression by activating the transcription factor CSL. It was originally thought that these CSL proteins suppressed Notch target transcription. However, further research showed that, when the intracellular domain binds to the complex, it switches from a repressor to an activator of transcription. Other proteins also participate in the intracellular portion of the notch signaling cascade. Notch signaling is initiated when Notch receptors on the cell surface engage ligands presented in trans on opposing cells. Despite the expansive size of the Notch extracellular domain, it has been demonstrated that EGF domains 11 and 12 are the critical determinants for interactions with Delta. Additional studies have implicated regions outside of Notch EGF11-12 in ligand binding. For example, Notch EGF domain 8 plays a role in selective recognition of Serrate/Jagged and EGF domains 6-15 are required for maximal signaling upon ligand stimulation. A crystal structure of the interacting regions of Notch1 and Delta-like 4 (Dll4) provided a molecular-level visualization of Notch-ligand interactions, and revealed that the N-terminal MNNL (or C2) and DSL domains of ligands bind to Notch EGF domains 12 and 11, respectively. The Notch1-Dll4 structure also illuminated a direct role for Notch O-linked fucose and glucose moieties in ligand recognition, and rationalized a structural mechanism for the glycan-mediated tuning of Notch signaling. Notch signaling is required in the regulation of polarity. For example, mutation experiments have shown that loss of Notch signaling causes abnormal anterior-posterior polarity in somites. Also, Notch signaling is required during left-right asymmetry determination in vertebrates. Early studies in the nematode model organism C. elegans indicate that Notch signaling has a major role in the induction of mesoderm and cell fate determination. As mentioned previously, C. elegans has two genes that encode for partially functionally redundant Notch homologs, glp-1 and lin-12. During C. elegans, GLP-1, the C. elegans Notch homolog, interacts with APX-1, the C. elegans Delta homolog. This signaling between particular blastomeres induces differentiation of cell fates and establishes the dorsal-ventral axis. Notch signaling is central to somitogenesis. In 1995, Notch1 was shown to be important for coordinating the segmentation of somites in mice. Further studies identified the role of Notch signaling in the segmentation clock. These studies hypothesized that the primary function of Notch signaling does not act on an individual cell, but coordinates cell clocks and keep them synchronized. This hypothesis explained the role of Notch signaling in the development of segmentation and has been supported by experiments in mice and zebrafish. Experiments with Delta1 mutant mice that show abnormal somitogenesis with loss of anterior/posterior polarity suggest that Notch signaling is also necessary for the maintenance of somite borders. During somitogenesis, a molecular oscillator in paraxial mesoderm cells dictates the precise rate of somite formation. A clock and wavefront model has been proposed in order to spatially determine the location and boundaries between somites. This process is highly regulated as somites must have the correct size and spacing in order to avoid malformations within the axial skeleton that may potentially lead to spondylocostal dysostosis. Several key components of the Notch signaling pathway help coordinate key steps in this process. In mice, mutations in Notch1, Dll1 or Dll3, Lfng, or Hes7 result in abnormal somite formation. Similarly, in humans, the following mutations have been seen to lead to development of spondylocostal dysostosis: DLL3, LFNG, or HES7. Notch signaling is known to occur inside ciliated, differentiating cells found in the first epidermal layers during early skin development. Furthermore, it has found that presenilin-2 works in conjunction with ARF4 to regulate Notch signaling during this development. However, it remains to be determined whether gamma-secretase has a direct or indirect role in modulating Notch signaling. Early findings on Notch signaling in central nervous system (CNS) development were performed mainly in Drosophila with mutagenesis experiments. For example, the finding that an embryonic lethal phenotype in Drosophila was associated with Notch dysfunction indicated that Notch mutations can lead to the failure of neural and Epidermal cell segregation in early Drosophila embryos. In the past decade, advances in mutation and knockout techniques allowed research on the Notch signaling pathway in mammalian models, especially rodents. The Notch signaling pathway was found to be critical mainly for neural progenitor cell (NPC) maintenance and self-renewal. In recent years, other functions of the Notch pathway have also been found, including glial cell specification, neurites development, as well as learning and memory. The Notch pathway is essential for maintaining NPCs in the developing brain. Activation of the pathway is sufficient to maintain NPCs in a proliferating state, whereas loss-of-function mutations in the critical components of the pathway cause precocious neuronal differentiation and NPC depletion. Modulators of the Notch signal, e.g., the Numb protein are able to antagonize Notch effects, resulting in the halting of cell cycle and differentiation of NPCs. Conversely, the fibroblast growth factor pathway promotes Notch signaling to keep stem cells of the cerebral cortex in the proliferative state, amounting to a mechanism regulating cortical surface area growth and, potentially, gyrification. In this way, Notch signaling controls NPC self-renewal as well as cell fate specification. A non-canonical branch of the Notch signaling pathway that involves the phosphorylation of STAT3 on the serine residue at amino acid position 727 and subsequent Hes3 expression increase (STAT3-Ser/Hes3 Signaling Axis) has been shown to regulate the number of NPCs in culture and in the adult rodent brain. In adult rodents and in cell culture, Notch3 promotes neuronal differentiation, having a role opposite to Notch1/2. This indicates that individual Notch receptors can have divergent functions, depending on cellular context. In vitro studies show that Notch can influence neurite development. In vivo, deletion of the Notch signaling modulator, Numb, disrupts neuronal maturation in the developing cerebellum, whereas deletion of Numb disrupts axonal arborization in sensory ganglia. Although the mechanism underlying this phenomenon is not clear, together these findings suggest Notch signaling might be crucial in neuronal maturation. In gliogenesis, Notch appears to have an instructive role that can directly promote the differentiation of many glial cell subtypes. For example, activation of Notch signaling in the retina favors the generation of Muller glia cells at the expense of neurons, whereas reduced Notch signaling induces production of ganglion cells, causing a reduction in the number of Muller glia. Apart from its role in development, evidence shows that Notch signaling is also involved in neuronal apoptosis, neurite retraction, and neurodegeneration of ischemic stroke in the brain In addition to developmental functions, Notch proteins and ligands are expressed in cells of the adult nervous system, suggesting a role in CNS plasticity throughout life. Adult mice heterozygous for mutations in either Notch1 or Cbf1 have deficits in spatial learning and memory. Similar results are seen in experiments with presenilins1 and 2, which mediate the Notch intramembranous cleavage. To be specific, conditional deletion of presenilins at 3 weeks after birth in excitatory neurons causes learning and memory deficits, neuronal dysfunction, and gradual neurodegeneration. Several gamma secretase inhibitors that underwent human clinical trials in Alzheimer's disease and MCI patients resulted in statistically significant worsening of cognition relative to controls, which is thought to be due to its incidental effect on Notch signalling. The Notch signaling pathway is a critical component of cardiovascular formation and morphogenesis in both development and disease. It is required for the selection of endothelial tip and stalk cells during sprouting angiogenesis. Notch signal pathway plays a crucial role in at least three cardiac development processes: Atrioventricular canal development, myocardial development, and cardiac outflow tract (OFT) development. Studies have revealed that both loss- and gain-of-function of the Notch pathway results in defects in AV canal development. In addition, the Notch target genes HEY1 and HEY2 are involved in restricting the expression of two critical developmental regulator proteins, BMP2 and Tbx2, to the AV canal. Notch signaling is also important for the process of AV EMT, which is required for AV canal maturation. After the AV canal boundary formation, a subset of endocardial cells lining the AV canal are activated by signals emanating from the myocardium and by interendocardial signaling pathways to undergo EMT. Notch1 deficiency results in defective induction of EMT. Very few migrating cells are seen and these lack mesenchymal morphology. Notch may regulate this process by activating matrix metalloproteinase2 (MMP2) expression, or by inhibiting vascular endothelial (VE)-cadherin expression in the AV canal endocardium while suppressing the VEGF pathway via VEGFR2. In RBPJk/CBF1-targeted mutants, the heart valve development is severely disrupted, presumably because of defective endocardial maturation and signaling. Some studies in Xenopus and in mouse embryonic stem cells indicate that cardiomyogenic commitment and differentiation require Notch signaling inhibition. Active Notch signaling is required in the ventricular endocardium for proper trabeculae development subsequent to myocardial specification by regulating BMP10, NRG1, and EphrinB2 expression. Notch signaling sustains immature cardiomyocyte proliferation in mammals  and zebrafish. The downstream effector of Notch signaling, HEY2, was also demonstrated to be important in regulating ventricular development by its expression in the interventricular septum and the endocardial cells of the cardiac cushions. Cardiomyocyte and smooth muscle cell-specific deletion of HEY2 results in impaired cardiac contractility, malformed right ventricle, and ventricular septal defects. During development of the aortic arch and the aortic arch arteries, the Notch receptors, ligands, and target genes display a unique expression pattern. When the Notch pathway was blocked, the induction of vascular smooth muscle cell marker expression failed to occur, suggesting that Notch is involved in the differentiation of cardiac neural crest cells into vascular cells during outflow tract development. Endothelial cells use the Notch signaling pathway to coordinate cellular behaviors during the blood vessel sprouting that occurs in angiogenesis. Activation of Notch takes place primarily in "connector" cells and cells that line patent stable blood vessels through direct interaction with the Notch ligand, Delta-like ligand 4 (Dll4), which is expressed in the endothelial tip cells. VEGF signaling, which is an important factor for migration and proliferation of endothelial cells, can be downregulated in cells with activated Notch signaling by lowering the levels of Vegf receptor transcript. Zebrafish embryos lacking Notch signaling exhibit ectopic and persistent expression of the zebrafish ortholog of VEGF3, flt4, within all endothelial cells, while Notch activation completely represses its expression. Notch signaling may be used to control the sprouting pattern of blood vessels during angiogenesis. When cells within a patent vessel are exposed to VEGF signaling, only a restricted number of them initiate the angiogenic process. Vegf is able to induce DLL4 expression. In turn, DLL4 expressing cells down-regulate Vegf receptors in neighboring cells through activation of Notch, thereby preventing their migration into the developing sprout. Likewise, during the sprouting process itself, the migratory behavior of connector cells must be limited to retain a patent connection to the original blood vessel. The formation of the pancreas from endoderm begins in early development. The expression of elements of the Notch signaling pathway have been found in the developing pancreas, suggesting that Notch signaling is important in pancreatic development. Evidence suggests Notch signaling regulates the progressive recruitment of endocrine cell types from a common precursor, acting through two possible mechanisms. 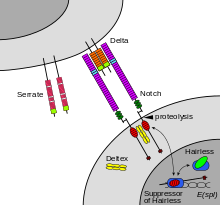 One is the "lateral inhibition", which specifies some cells for a primary fate but others for a secondary fate among cells that have the potential to adopt the same fate. Lateral inhibition is required for many types of cell fate determination. Here, it could explain the dispersed distribution of endocrine cells within pancreatic epithelium. A second mechanism is "suppressive maintenance", which explains the role of Notch signaling in pancreas differentiation. Fibroblast growth factor10 is thought to be important in this activity, but the details are unclear. The role of Notch signaling in the regulation of gut development has been indicated in several reports. Mutations in elements of the Notch signaling pathway affect the earliest intestinal cell fate decisions during zebrafish development. Transcriptional analysis and gain of function experiments revealed that Notch signaling targets Hes1 in the intestine and regulates a binary cell fate decision between adsorptive and secretory cell fates. Early in vitro studies have found the Notch signaling pathway functions as down-regulator in osteoclastogenesis and osteoblastogenesis. Notch1 is expressed in the mesenchymal condensation area and subsequently in the hypertrophic chondrocytes during chondrogenesis. Overexpression of Notch signaling inhibits bone morphogenetic protein2-induced osteoblast differentiation. Overall, Notch signaling has a major role in the commitment of mesenchymal cells to the osteoblastic lineage and provides a possible therapeutic approach to bone regeneration. Notch is implicated in development of alveoli in the lung. Aberrant Notch signaling is a driver of T cell acute lymphoblastic leukemia (T-ALL) and is mutated in at least 65% of all T-ALL cases. Notch signaling can be activated by mutations in Notch itself, inactivating mutations in FBXW7 (a negative regulator of Notch1), or rarely by t(7;9)(q34;q34.3) translocation. In the context of T-ALL, Notch activity cooperates with additional oncogenic lesions such as c-MYC to activate anabolic pathways such as ribosome and protein biosynthesis thereby promoting leukemia cell growth. The involvement of Notch signaling in many cancers has led to investigation of notch inhibitors (especially gamma-secretase inhibitors) as cancer treatments which are in different phases of clinical trials. As of 2013[update] at least 7 notch inhibitors were in clinical trials. MK-0752 has given promising results in an early clinical trial for breast cancer. It is possible to engineer synthetic Notch receptors by replacing the extracellular receptor and intracellular transcriptional domains with other domains of choice. This allows researchers to select which ligands are detected, and which genes are upregulated in response. Using this technology, cells can report or change their behavior in response to contact with user-specified signals, facilitating new avenues of both basic and applied research into cell-cell signaling. Notably, this system allows multiple synthetic pathways to be engineered into a cell in parallel. ^ a b Artavanis-Tsakonas S, Rand MD, Lake RJ (Apr 1999). "Notch signaling: cell fate control and signal integration in development". Science. 284 (5415): 770–6. Bibcode:1999Sci...284..770A. doi:10.1126/science.284.5415.770. PMID 10221902. ^ a b Kumar R, Juillerat-Jeanneret L, Golshayan D (April 2016). "Notch Antagonists: Potential Modulators of Cancer and Inflammatory Diseases". J Med Chem. 59 (17): 7719–37. doi:10.1021/acs.jmedchem.5b01516. PMID 27045975. ^ Brou C, Logeat F, Gupta N, Bessia C, LeBail O, Doedens JR, Cumano A, Roux P, Black RA, Israël A (Feb 2000). "A novel proteolytic cleavage involved in Notch signaling: the role of the disintegrin-metalloprotease TACE". Molecular Cell. 5 (2): 207–16. doi:10.1016/S1097-2765(00)80417-7. PMID 10882063. ^ Morgan TH (1917). "The theory of the gene". The American Naturalist. 51 (609): 513–544. doi:10.1086/279629. ^ Morgan T (1928). The theory of the gene (revised ed.). Yale University Press. pp. 77–81. ISBN 978-0-8240-1384-4. ^ Wharton KA, Johansen KM, Xu T, Artavanis-Tsakonas S (Dec 1985). "Nucleotide sequence from the neurogenic locus notch implies a gene product that shares homology with proteins containing EGF-like repeats". Cell. 43 (3 Pt 2): 567–81. doi:10.1016/0092-8674(85)90229-6. PMID 3935325. ^ Kidd S, Kelley MR, Young MW (Sep 1986). "Sequence of the notch locus of Drosophila melanogaster: relationship of the encoded protein to mammalian clotting and growth factors". Molecular and Cellular Biology. 6 (9): 3094–108. doi:10.1128/mcb.6.9.3094. PMC 367044. PMID 3097517. ^ Greenwald IS, Sternberg PW, Horvitz HR (Sep 1983). "The lin-12 locus specifies cell fates in Caenorhabditis elegans". Cell. 34 (2): 435–44. doi:10.1016/0092-8674(83)90377-X. PMID 6616618. ^ a b Austin J, Kimble J (Nov 1987). "glp-1 is required in the germ line for regulation of the decision between mitosis and meiosis in C. elegans". Cell. 51 (4): 589–99. doi:10.1016/0092-8674(87)90128-0. PMID 3677168. ^ Priess JR, Schnabel H, Schnabel R (Nov 1987). "The glp-1 locus and cellular interactions in early C. elegans embryos". Cell. 51 (4): 601–11. doi:10.1016/0092-8674(87)90129-2. PMID 3677169. ^ Greenwald I (Dec 1985). "lin-12, a nematode homeotic gene, is homologous to a set of mammalian proteins that includes epidermal growth factor". Cell. 43 (3 Pt 2): 583–90. doi:10.1016/0092-8674(85)90230-2. PMID 3000611. ^ Oswald F, Täuber B, Dobner T, Bourteele S, Kostezka U, Adler G, Liptay S, Schmid RM (Nov 2001). "p300 acts as a transcriptional coactivator for mammalian Notch-1". Molecular and Cellular Biology. 21 (22): 7761–74. doi:10.1128/MCB.21.22.7761-7774.2001. PMC 99946. PMID 11604511. ^ Lieber T, Kidd S, Alcamo E, Corbin V, Young MW (Oct 1993). "Antineurogenic phenotypes induced by truncated Notch proteins indicate a role in signal transduction and may point to a novel function for Notch in nuclei". Genes & Development. 7 (10): 1949–65. doi:10.1101/gad.7.10.1949. PMID 8406001. ^ Struhl G, Fitzgerald K, Greenwald I (Jul 1993). "Intrinsic activity of the Lin-12 and Notch intracellular domains in vivo". Cell. 74 (2): 331–45. doi:10.1016/0092-8674(93)90424-O. PMID 8343960. ^ Ellisen LW, Bird J, West DC, Soreng AL, Reynolds TC, Smith SD, Sklar J (Aug 1991). "TAN-1, the human homolog of the Drosophila notch gene, is broken by chromosomal translocations in T lymphoblastic neoplasms". Cell. 66 (4): 649–61. doi:10.1016/0092-8674(91)90111-B. PMID 1831692. ^ Struhl G, Adachi A (May 1998). "Nuclear access and action of notch in vivo". Cell. 93 (4): 649–60. doi:10.1016/S0092-8674(00)81193-9. PMID 9604939. ^ a b Greenwald I (Jul 2012). "Notch and the awesome power of genetics". Genetics. 191 (3): 655–69. doi:10.1534/genetics.112.141812. PMC 3389966. PMID 22785620. ^ Struhl G, Greenwald I (Jan 2001). "Presenilin-mediated transmembrane cleavage is required for Notch signal transduction in Drosophila". Proceedings of the National Academy of Sciences of the United States of America. 98 (1): 229–34. Bibcode:2001PNAS...98..229S. doi:10.1073/pnas.98.1.229. PMC 14573. PMID 11134525. ^ Artavanis-Tsakonas S, Matsuno K, Fortini ME (Apr 1995). "Notch signaling". Science. 268 (5208): 225–32. Bibcode:1995Sci...268..225A. doi:10.1126/science.7716513. PMID 7716513. ^ Singson A, Mercer KB, L'Hernault SW (Apr 1998). "The C. elegans spe-9 gene encodes a sperm transmembrane protein that contains EGF-like repeats and is required for fertilization". Cell. 93 (1): 71–9. doi:10.1016/S0092-8674(00)81147-2. PMID 9546393. ^ Nam Y, Sliz P, Song L, Aster JC, Blacklow SC (Mar 2006). "Structural basis for cooperativity in recruitment of MAML coactivators to Notch transcription complexes". Cell. 124 (5): 973–83. doi:10.1016/j.cell.2005.12.037. PMID 16530044. ^ Wilson JJ, Kovall RA (Mar 2006). "Crystal structure of the CSL-Notch-Mastermind ternary complex bound to DNA". Cell. 124 (5): 985–96. doi:10.1016/j.cell.2006.01.035. PMID 16530045. ^ Gaiano N, Fishell G (2002). "The role of notch in promoting glial and neural stem cell fates". Annual Review of Neuroscience. 25 (1): 471–90. doi:10.1146/annurev.neuro.25.030702.130823. PMID 12052917. ^ a b c Bolós V, Grego-Bessa J, de la Pompa JL (May 2007). "Notch signaling in development and cancer". Endocrine Reviews. 28 (3): 339–63. doi:10.1210/er.2006-0046. PMID 17409286. ^ Aguirre A, Rubio ME, Gallo V (Sep 2010). "Notch and EGFR pathway interaction regulates neural stem cell number and self-renewal". Nature. 467 (7313): 323–7. Bibcode:2010Natur.467..323A. doi:10.1038/nature09347. PMC 2941915. PMID 20844536. ^ Hitoshi S, Alexson T, Tropepe V, Donoviel D, Elia AJ, Nye JS, Conlon RA, Mak TW, Bernstein A, van der Kooy D (Apr 2002). "Notch pathway molecules are essential for the maintenance, but not the generation, of mammalian neural stem cells". Genes & Development. 16 (7): 846–58. doi:10.1101/gad.975202. PMC 186324. PMID 11937492. ^ Liu ZJ, Shirakawa T, Li Y, Soma A, Oka M, Dotto GP, Fairman RM, Velazquez OC, Herlyn M (Jan 2003). "Regulation of Notch1 and Dll4 by vascular endothelial growth factor in arterial endothelial cells: implications for modulating arteriogenesis and angiogenesis". Molecular and Cellular Biology. 23 (1): 14–25. doi:10.1128/MCB.23.1.14-25.2003. PMC 140667. PMID 12482957. ^ a b Grego-Bessa J, Luna-Zurita L, del Monte G, Bolós V, Melgar P, Arandilla A, Garratt AN, Zang H, Mukouyama YS, Chen H, Shou W, Ballestar E, Esteller M, Rojas A, Pérez-Pomares JM, de la Pompa JL (Mar 2007). "Notch signaling is essential for ventricular chamber development". Developmental Cell. 12 (3): 415–29. doi:10.1016/j.devcel.2006.12.011. PMC 2746361. PMID 17336907. ^ Murtaugh LC, Stanger BZ, Kwan KM, Melton DA (Dec 2003). "Notch signaling controls multiple steps of pancreatic differentiation". Proceedings of the National Academy of Sciences of the United States of America. 100 (25): 14920–5. Bibcode:2003PNAS..10014920M. doi:10.1073/pnas.2436557100. PMC 299853. PMID 14657333. ^ Sander GR, Powell BC (Apr 2004). "Expression of notch receptors and ligands in the adult gut". The Journal of Histochemistry and Cytochemistry. 52 (4): 509–16. doi:10.1177/002215540405200409. PMID 15034002. ^ a b Nobta M, Tsukazaki T, Shibata Y, Xin C, Moriishi T, Sakano S, Shindo H, Yamaguchi A (Apr 2005). "Critical regulation of bone morphogenetic protein-induced osteoblastic differentiation by Delta1/Jagged1-activated Notch1 signaling". The Journal of Biological Chemistry. 280 (16): 15842–8. doi:10.1074/jbc.M412891200. PMID 15695512. ^ Kim PG, Albacker CE, Lu YF, Jang IH, Lim Y, Heffner GC, Arora N, Bowman TV, Lin MI, Lensch MW, De Los Angeles A, Zon LI, Loewer S, Daley GQ (Jan 2013). "Signaling axis involving Hedgehog, Notch, and Scl promotes the embryonic endothelial-to-hematopoietic transition". Proceedings of the National Academy of Sciences of the United States of America. 110 (2): E141–50. Bibcode:2013PNAS..110E.141K. doi:10.1073/pnas.1214361110. PMC 3545793. PMID 23236128. ^ Laky K, Fowlkes BJ (Apr 2008). "Notch signaling in CD4 and CD8 T cell development". Current Opinion in Immunology. 20 (2): 197–202. doi:10.1016/j.coi.2008.03.004. PMC 2475578. PMID 18434124. ^ Dontu G, Jackson KW, McNicholas E, Kawamura MJ, Abdallah WM, Wicha MS (2004). "Role of Notch signaling in cell-fate determination of human mammary stem/progenitor cells". Breast Cancer Research. 6 (6): R605–15. doi:10.1186/bcr920. PMC 1064073. PMID 15535842. ^ a b Lai EC (Mar 2004). "Notch signaling: control of cell communication and cell fate". Development. 131 (5): 965–73. doi:10.1242/dev.01074. PMID 14973298. ^ "The NOTCH pathway and Cancer". healthvalue.net. Retrieved 2009-03-08. ^ Sharma VM, Draheim KM, Kelliher MA (Apr 2007). "The Notch1/c-Myc pathway in T cell leukemia". Cell Cycle. 6 (8): 927–30. doi:10.4161/cc.6.8.4134. PMID 17404512. ^ Moellering RE, Cornejo M, Davis TN, Del Bianco C, Aster JC, Blacklow SC, Kung AL, Gilliland DG, Verdine GL, Bradner JE (Nov 2009). "Direct inhibition of the NOTCH transcription factor complex". Nature. 462 (7270): 182–8. Bibcode:2009Natur.462..182M. doi:10.1038/nature08543. PMC 2951323. PMID 19907488. ^ Arora PS, Ansari AZ (Nov 2009). "Chemical biology: A Notch above other inhibitors". Nature. 462 (7270): 171–3. Bibcode:2009Natur.462..171A. doi:10.1038/462171a. PMID 19907487. ^ Bagley, Katherine (2009-11-11). "New drug target for cancer". The Scientist. Retrieved 2009-11-11. ^ Bhandari DR, Seo KW, Roh KH, Jung JW, Kang SK, Kang KS (2010). Pera M, ed. "REX-1 expression and p38 MAPK activation status can determine proliferation/differentiation fates in human mesenchymal stem cells". PLoS One. 5 (5): e10493. Bibcode:2010PLoSO...510493B. doi:10.1371/journal.pone.0010493. PMC 2864743. PMID 20463961. ^ Munro S, Freeman M (Jul 2000). "The notch signalling regulator fringe acts in the Golgi apparatus and requires the glycosyltransferase signature motif DXD". Current Biology. 10 (14): 813–20. doi:10.1016/S0960-9822(00)00578-9. PMID 10899003. ^ Ma B, Simala-Grant JL, Taylor DE (Dec 2006). "Fucosylation in prokaryotes and eukaryotes". Glycobiology. 16 (12): 158R–184R. doi:10.1093/glycob/cwl040. PMID 16973733. ^ Shao L, Luo Y, Moloney DJ, Haltiwanger R (Nov 2002). "O-glycosylation of EGF repeats: identification and initial characterization of a UDP-glucose: protein O-glucosyltransferase". Glycobiology. 12 (11): 763–70. doi:10.1093/glycob/cwf085. PMID 12460944. ^ Lu L, Stanley P (2006). Roles of O-fucose glycans in notch signaling revealed by mutant mice. Methods in Enzymology. 417. pp. 127–36. CiteSeerX 10.1.1.620.2510. doi:10.1016/S0076-6879(06)17010-X. ISBN 9780121828226. PMID 17132502. ^ Thomas GB, van Meyel DJ (Feb 2007). "The glycosyltransferase Fringe promotes Delta-Notch signaling between neurons and glia, and is required for subtype-specific glial gene expression". Development. 134 (3): 591–600. doi:10.1242/dev.02754. PMID 17215308. ^ LaVoie MJ, Selkoe DJ (Sep 2003). "The Notch ligands, Jagged and Delta, are sequentially processed by alpha-secretase and presenilin/gamma-secretase and release signaling fragments". The Journal of Biological Chemistry. 278 (36): 34427–37. doi:10.1074/jbc.M302659200. PMID 12826675. ^ van Tetering G, van Diest P, Verlaan I, van der Wall E, Kopan R, Vooijs M (Nov 2009). "Metalloprotease ADAM10 is required for Notch1 site 2 cleavage". The Journal of Biological Chemistry. 284 (45): 31018–27. doi:10.1074/jbc.M109.006775. PMC 2781502. PMID 19726682. ^ Desbordes S, López-Schier H (2005). Drosophila Patterning: Delta-Notch Interactions. Encyclopedia of Life Sciences. p. 4. doi:10.1038/npg.els.0004194. ISBN 978-0470016176. ^ Borggrefe T, Liefke R (Jan 2012). "Fine-tuning of the intracellular canonical Notch signaling pathway". Cell Cycle. 11 (2): 264–76. doi:10.4161/cc.11.2.18995. PMID 22223095. ^ Rebay, Ilaria; Fleming, Robert J.; Fehon, Richard G.; Cherbas, Lucy; Cherbas, Peter; Artavanis-Tsakonas, Spyros (1991). "Specific EGF repeats of Notch mediate interactions with Delta and serrate: Implications for notch as a multifunctional receptor". Cell. 67 (4): 687–699. doi:10.1016/0092-8674(91)90064-6. ^ Rebay, Ilaria; Fleming, Robert J.; Fehon, Richard G.; Cherbas, Lucy; Cherbas, Peter; Artavanis-Tsakonas, Spyros (2012). "A mutation in EGF repeat-8 of Notch discriminates between Serrate/Jagged and Delta family ligands". Cell. 67 (4): 687–699. doi:10.1016/0092-8674(91)90064-6. ^ "Intrinsic selectivity of Notch 1 for Delta-like 4 over Delta-like 1". Journal of Biological Chemistry. 2013. ^ a b Luca VC, Jude KM, Pierce NW, Nachury MV, Fischer S, Garcia KC (2015). "Structural basis for Notch1 engagement of Delta-like 4". Science. 347 (6224): 847–853. Bibcode:2015Sci...347..847L. doi:10.1126/science.1261093. PMC 4445638. PMID 25700513. ^ Feller J, Schneider A, Schuster-Gossler K, Gossler A (Aug 2008). "Noncyclic Notch activity in the presomitic mesoderm demonstrates uncoupling of somite compartmentalization and boundary formation". Genes & Development. 22 (16): 2166–71. doi:10.1101/gad.480408. PMC 2518812. PMID 18708576. ^ Levin M (Jan 2005). "Left-right asymmetry in embryonic development: a comprehensive review". Mechanisms of Development. 122 (1): 3–25. doi:10.1016/j.mod.2004.08.006. PMID 15582774. ^ Austin J, Kimble J (Nov 1987). "glp-1 is required in the germ line for regulation of the decision between mitosis and meiosis in C. elegans". Cell. 51 (4): 589–99. doi:10.1016/0092-8674(87)90128-0. PMID 3677168. ^ Lambie, E. J; Kimble, J (1991). "Two homologous regulatory genes, lin-12 and glp-1, have overlapping functions". Development. 112 (1): 231–40. PMID 1769331. ^ Gilbert SF (2016). Developmental biology (11th ed.). Sinauer. p. 272. ISBN 978-1-60535-470-5. ^ a b Conlon RA, Reaume AG, Rossant J (May 1995). "Notch1 is required for the coordinate segmentation of somites". Development. 121 (5): 1533–45. PMID 7789282. ^ Hrabĕ de Angelis M, McIntyre J, Gossler A (Apr 1997). "Maintenance of somite borders in mice requires the Delta homologue DII1". Nature. 386 (6626): 717–21. Bibcode:1997Natur.386..717D. doi:10.1038/386717a0. PMID 9109488. ^ van Eeden FJ, Granato M, Schach U, Brand M, Furutani-Seiki M, Haffter P, Hammerschmidt M, Heisenberg CP, Jiang YJ, Kane DA, Kelsh RN, Mullins MC, Odenthal J, Warga RM, Allende ML, Weinberg ES, Nüsslein-Volhard C (Dec 1996). "Mutations affecting somite formation and patterning in the zebrafish, Danio rerio". Development. 123: 153–64. PMID 9007237. ^ Huppert SS, Ilagan MX, De Strooper B, Kopan R (May 2005). "Analysis of Notch function in presomitic mesoderm suggests a gamma-secretase-independent role for presenilins in somite differentiation". Developmental Cell. 8 (5): 677–88. doi:10.1016/j.devcel.2005.02.019. PMID 15866159. ^ Wahi, K; Bochter, M. S; Cole, S. E (2016). "The many roles of Notch signaling during vertebrate somitogenesis". Seminars in Cell & Developmental Biology. 49: 68–75. doi:10.1016/j.semcdb.2014.11.010. PMID 25483003. ^ Lowell, S., Jones, P., Le Roux, I., Dunne, J., & Watt, F. M. (2000). Stimulation of human epidermal differentiation by Delta–Notch signalling at the boundaries of stem-cell clusters. Current Biology, 10(9), 491–500. ^ Ezratty, E. J., Pasolli, H. A., & Fuchs, E. (2016). A Presenilin-2–ARF4 trafficking axis modulates Notch signaling during epidermal differentiation. J Cell Biol, 214(1), 89–101. ^ Poulson DF (Mar 1937). "Chromosomal Deficiencies and the Embryonic Development of Drosophila Melanogaster". Proceedings of the National Academy of Sciences of the United States of America. 23 (3): 133–7. Bibcode:1937PNAS...23..133P. doi:10.1073/pnas.23.3.133. PMC 1076884. PMID 16588136. ^ a b Furukawa T, Mukherjee S, Bao ZZ, Morrow EM, Cepko CL (2000). "Rax, Hes1, and Notch1 promote the formation of Muller glia by postnatal retinal progenitor cells". Neuron. 26 (2): 383–394. doi:10.1016/S0896-6273(00)81171-X. ^ a b Scheer N, Groth A, Hans S, Campos-Ortega JA (Apr 2001). "An instructive function for Notch in promoting gliogenesis in the zebrafish retina". Development. 128 (7): 1099–107. PMID 11245575. ^ a b Redmond L, Oh SR, Hicks C, Weinmaster G, Ghosh A (Jan 2000). "Nuclear Notch1 signaling and the regulation of dendritic development". Nature Neuroscience. 3 (1): 30–40. doi:10.1038/71104. PMID 10607392. ^ a b Costa RM, Honjo T, Silva AJ (2003). "Learning and memory deficits in Notch mutant mice". Current Biology. 13 (15): 1348–54. doi:10.1016/S0960-9822(03)00492-5. PMID 12906797. ^ Zhong W, Jiang MM, Weinmaster G, Jan LY, Jan YN (May 1997). "Differential expression of mammalian Numb, Numblike and Notch1 suggests distinct roles during mouse cortical neurogenesis". Development. 124 (10): 1887–97. PMID 9169836. ^ Li HS, Wang D, Shen Q, Schonemann MD, Gorski JA, Jones KR, Temple S, Jan LY, Jan YN (Dec 2003). "Inactivation of Numb and Numblike in embryonic dorsal forebrain impairs neurogenesis and disrupts cortical morphogenesis". Neuron. 40 (6): 1105–18. doi:10.1016/S0896-6273(03)00755-4. PMID 14687546. ^ Rash, BG; Tomasi, S; Lim, HD; Suh, CY; Vaccarino, FM (26 June 2013). "Cortical gyrification induced by fibroblast growth factor 2 in the mouse brain". The Journal of Neuroscience. 33 (26): 10802–14. doi:10.1523/JNEUROSCI.3621-12.2013. PMC 3693057. PMID 23804101. ^ Androutsellis-Theotokis A, Leker RR, Soldner F, Hoeppner DJ, Ravin R, Poser SW, Rueger MA, Bae SK, Kittappa R, McKay RD (Aug 2006). "Notch signalling regulates stem cell numbers in vitro and in vivo". Nature. 442 (7104): 823–6. Bibcode:2006Natur.442..823A. doi:10.1038/nature04940. PMID 16799564. ^ Rusanescu G, Mao J (Oct 2014). "Notch3 is necessary for neuronal differentiation and maturation in the adult spinal cord". Journal of Cellular and Molecular Medicine. 18 (10): 2103–16. doi:10.1111/jcmm.12362. PMC 4244024. PMID 25164209. ^ Klein AL, Zilian O, Suter U, Taylor V (2004). "Murine numb regulates granule cell maturation in the cerebellum". Developmental Biology. 266 (1): 161–77. doi:10.1016/j.ydbio.2003.10.017. PMID 14729486. ^ Huang EJ, Li H, Tang AA, Wiggins AK, Neve RL, Zhong W, Jan LY, Jan YN (Jan 2005). "Targeted deletion of numb and numblike in sensory neurons reveals their essential functions in axon arborization". Genes & Development. 19 (1): 138–51. doi:10.1101/gad.1246005. PMC 540232. PMID 15598981. ^ Woo, Ha-Na (14 October 2009). "Alzheimer's disease and Notch Signaling". Biochemical and Biophysical Research Communications. ^ Presente A, Andres A, Nye JS (Oct 2001). "Requirement of Notch in adulthood for neurological function and longevity". NeuroReport. 12 (15): 3321–5. doi:10.1097/00001756-200110290-00035. PMID 11711879. ^ Saura CA, Choi SY, Beglopoulos V, Malkani S, Zhang D, Shankaranarayana Rao BS, Chattarji S, Kelleher RJ, Kandel ER, Duff K, Kirkwood A, Shen J (2004). "Loss of presenilin function causes impairments of memory and synaptic plasticity followed by age-dependent neurodegeneration". Neuron. 42 (1): 23–36. doi:10.1016/S0896-6273(04)00182-5. PMID 15066262. ^ Lessons from a failed γ-secretase Alzheimer trial, B. De Strooper, Cell, 2014, 159, 721–726. ^ Kume T (2012). Ligand-dependent Notch signaling in vascular formation. Advances in Experimental Medicine and Biology. 727. pp. 210–22. doi:10.1007/978-1-4614-0899-4_16. ISBN 978-1-4614-0898-7. PMID 22399350. ^ a b c Niessen K, Karsan A (May 2008). "Notch signaling in cardiac development". Circulation Research. 102 (10): 1169–81. doi:10.1161/CIRCRESAHA.108.174318. PMID 18497317. ^ Rutenberg JB, Fischer A, Jia H, Gessler M, Zhong TP, Mercola M (Nov 2006). "Developmental patterning of the cardiac atrioventricular canal by Notch and Hairy-related transcription factors". Development. 133 (21): 4381–90. doi:10.1242/dev.02607. PMC 3619037. PMID 17021042. ^ Kokubo H, Tomita-Miyagawa S, Hamada Y, Saga Y (Feb 2007). "Hesr1 and Hesr2 regulate atrioventricular boundary formation in the developing heart through the repression of Tbx2". Development. 134 (4): 747–55. doi:10.1242/dev.02777. PMID 17259303. ^ a b Timmerman LA, Grego-Bessa J, Raya A, Bertrán E, Pérez-Pomares JM, Díez J, Aranda S, Palomo S, McCormick F, Izpisúa-Belmonte JC, de la Pompa JL (Jan 2004). "Notch promotes epithelial-mesenchymal transition during cardiac development and oncogenic transformation". Genes & Development. 18 (1): 99–115. doi:10.1101/gad.276304. PMC 314285. PMID 14701881. ^ Crosby CV, Fleming PA, Argraves WS, Corada M, Zanetta L, Dejana E, Drake CJ (Apr 2005). "VE-cadherin is not required for the formation of nascent blood vessels but acts to prevent their disassembly". Blood. 105 (7): 2771–6. doi:10.1182/blood-2004-06-2244. PMID 15604224. ^ Noseda M, McLean G, Niessen K, Chang L, Pollet I, Montpetit R, Shahidi R, Dorovini-Zis K, Li L, Beckstead B, Durand RE, Hoodless PA, Karsan A (Apr 2004). "Notch activation results in phenotypic and functional changes consistent with endothelial-to-mesenchymal transformation". Circulation Research. 94 (7): 910–7. doi:10.1161/01.RES.0000124300.76171.C9. PMID 14988227. ^ Rones MS, McLaughlin KA, Raffin M, Mercola M (Sep 2000). "Serrate and Notch specify cell fates in the heart field by suppressing cardiomyogenesis". Development. 127 (17): 3865–76. PMID 10934030. ^ Nemir M, Croquelois A, Pedrazzini T, Radtke F (Jun 2006). "Induction of cardiogenesis in embryonic stem cells via downregulation of Notch1 signaling". Circulation Research. 98 (12): 1471–8. doi:10.1161/01.RES.0000226497.52052.2a. PMID 16690879. ^ Croquelois, Adrien; Domenighetti, Andrea A.; Nemir, Mohamed; Lepore, Mario; Rosenblatt-Velin, Nathalie; Radtke, Freddy; Pedrazzini, Thierry (22 December 2008). "Control of the adaptive response of the heart to stress via the Notch1 receptor pathway". The Journal of Experimental Medicine. 205 (13): 3173–3185. doi:10.1084/jem.20081427. PMC 2605223. PMID 19064701. ^ Collesi, Chiara; Zentilin, Lorena; Sinagra, Gianfranco; Giacca, Mauro (6 October 2008). "Notch1 signaling stimulates proliferation of immature cardiomyocytes". The Journal of Cell Biology. 183 (1): 117–128. doi:10.1083/jcb.200806091. PMC 2557047. PMID 18824567. ^ Campa, Víctor M.; Gutiérrez-Lanza, Raquel; Cerignoli, Fabio; Díaz-Trelles, Ramón; Nelson, Brandon; Tsuji, Toshiya; Barcova, Maria; Jiang, Wei; Mercola, Mark (6 October 2008). "Notch activates cell cycle reentry and progression in quiescent cardiomyocytes". The Journal of Cell Biology. 183 (1): 129–141. doi:10.1083/jcb.200806104. PMC 2557048. PMID 18838555. ^ Zhao, L.; Borikova, A. L.; Ben-Yair, R.; Guner-Ataman, B.; MacRae, C. A.; Lee, R. T.; Burns, C. G.; Burns, C. E. (13 January 2014). "Notch signaling regulates cardiomyocyte proliferation during zebrafish heart regeneration". Proceedings of the National Academy of Sciences. 111 (4): 1403–1408. Bibcode:2014PNAS..111.1403Z. doi:10.1073/pnas.1311705111. PMC 3910613. PMID 24474765. ^ Wang J, Sridurongrit S, Dudas M, Thomas P, Nagy A, Schneider MD, Epstein JA, Kaartinen V (Oct 2005). "Atrioventricular cushion transformation is mediated by ALK2 in the developing mouse heart". Developmental Biology. 286 (1): 299–310. doi:10.1016/j.ydbio.2005.07.035. PMC 1361261. PMID 16140292. ^ Xin M, Small EM, van Rooij E, Qi X, Richardson JA, Srivastava D, Nakagawa O, Olson EN (May 2007). "Essential roles of the bHLH transcription factor Hrt2 in repression of atrial gene expression and maintenance of postnatal cardiac function". Proceedings of the National Academy of Sciences of the United States of America. 104 (19): 7975–80. Bibcode:2007PNAS..104.7975X. doi:10.1073/pnas.0702447104. PMC 1876557. PMID 17468400. ^ High FA, Zhang M, Proweller A, Tu L, Parmacek MS, Pear WS, Epstein JA (Feb 2007). "An essential role for Notch in neural crest during cardiovascular development and smooth muscle differentiation". The Journal of Clinical Investigation. 117 (2): 353–63. doi:10.1172/JCI30070. PMC 1783803. PMID 17273555. ^ Hellström M, Phng LK, Hofmann JJ, Wallgard E, Coultas L, Lindblom P, Alva J, Nilsson AK, Karlsson L, Gaiano N, Yoon K, Rossant J, Iruela-Arispe ML, Kalén M, Gerhardt H, Betsholtz C (Feb 2007). "Dll4 signalling through Notch1 regulates formation of tip cells during angiogenesis". Nature. 445 (7129): 776–80. Bibcode:2007Natur.445..776H. doi:10.1038/nature05571. PMID 17259973. ^ Leslie JD, Ariza-McNaughton L, Bermange AL, McAdow R, Johnson SL, Lewis J (2007). "Endothelial signalling by the Notch ligand Delta-like 4 restricts angiogenesis". Development. 134 (5): 839–44. doi:10.1242/dev.003244. PMID 17251261. ^ Lobov IB, Renard RA, Papadopoulos N, Gale NW, Thurston G, Yancopoulos GD, Wiegand SJ (Feb 2007). "Delta-like ligand 4 (Dll4) is induced by VEGF as a negative regulator of angiogenic sprouting". Proceedings of the National Academy of Sciences of the United States of America. 104 (9): 3219–24. Bibcode:2007PNAS..104.3219L. doi:10.1073/pnas.0611206104. PMC 1805530. PMID 17296940. ^ Siekmann AF, Lawson ND (2007). "Notch signalling limits angiogenic cell behaviour in developing zebrafish arteries". Nature. 445 (7129): 781–4. Bibcode:2007Natur.445..781S. doi:10.1038/nature05577. PMID 17259972. ^ a b Siekmann AF, Lawson ND (2007). "Notch signalling and the regulation of angiogenesis". Cell Adhesion & Migration. 1 (2): 104–6. doi:10.4161/cam.1.2.4488. PMC 2633979. PMID 19329884. ^ Zachary I, Gliki G (2001). "Signaling transduction mechanisms mediating biological actions of the vascular endothelial growth factor family". Cardiovascular Research. 49 (3): 568–81. doi:10.1016/S0008-6363(00)00268-6. PMID 11166270. ^ Williams CK, Li JL, Murga M, Harris AL, Tosato G (2006). "Up-regulation of the Notch ligand Delta-like 4 inhibits VEGF-induced endothelial cell function". Blood. 107 (3): 931–9. doi:10.1182/blood-2005-03-1000. PMC 1895896. PMID 16219802. ^ Lawson ND, Scheer N, Pham VN, Kim CH, Chitnis AB, Campos-Ortega JA, Weinstein BM (Oct 2001). "Notch signaling is required for arterial-venous differentiation during embryonic vascular development". Development. 128 (19): 3675–83. PMID 11585794. ^ Apelqvist A, Li H, Sommer L, Beatus P, Anderson DJ, Honjo T, Hrabe de Angelis M, Lendahl U, Edlund H (1999). "Notch signalling controls pancreatic cell differentiation". Nature. 400 (6747): 877–81. Bibcode:1999Natur.400..877A. doi:10.1038/23716. PMID 10476967. ^ Lammert E, Brown J, Melton DA (2000). "Notch gene expression during pancreatic organogenesis". Mechanisms of Development. 94 (1–2): 199–203. doi:10.1016/S0925-4773(00)00317-8. PMID 10842072. ^ Field HA, Dong PD, Beis D, Stainier DY (2003). "Formation of the digestive system in zebrafish. II. Pancreas morphogenesis". Developmental Biology. 261 (1): 197–208. doi:10.1016/S0012-1606(03)00308-7. PMID 12941629. ^ Jensen J, Pedersen EE, Galante P, Hald J, Heller RS, Ishibashi M, Kageyama R, Guillemot F, Serup P, Madsen OD (2000). "Control of endodermal endocrine development by Hes-1". Nature Genetics. 24 (1): 36–44. doi:10.1038/71657. PMID 10615124. ^ Jensen J (2004). "Gene regulatory factors in pancreatic development". Developmental Dynamics. 229 (1): 176–200. doi:10.1002/dvdy.10460. PMID 14699589. ^ Norgaard GA, Jensen JN, Jensen J (2003). "FGF10 signaling maintains the pancreatic progenitor cell state revealing a novel role of Notch in organ development". Developmental Biology. 264 (2): 323–38. doi:10.1016/j.ydbio.2003.08.013. PMID 14651921. ^ a b Crosnier C, Vargesson N, Gschmeissner S, Ariza-McNaughton L, Morrison A, Lewis J (2005). "Delta-Notch signalling controls commitment to a secretory fate in the zebrafish intestine". Development. 132 (5): 1093–104. doi:10.1242/dev.01644. PMID 15689380. ^ Yamada T, Yamazaki H, Yamane T, Yoshino M, Okuyama H, Tsuneto M, Kurino T, Hayashi S, Sakano S (Mar 2003). "Regulation of osteoclast development by Notch signaling directed to osteoclast precursors and through stromal cells". Blood. 101 (6): 2227–34. doi:10.1182/blood-2002-06-1740. PMID 12411305. ^ Watanabe N, Tezuka Y, Matsuno K, Miyatani S, Morimura N, Yasuda M, Fujimaki R, Kuroda K, Hiraki Y, Hozumi N, Tezuka K (2003). "Suppression of differentiation and proliferation of early chondrogenic cells by Notch". Journal of Bone and Mineral Metabolism. 21 (6): 344–52. doi:10.1007/s00774-003-0428-4. PMID 14586790. ^ Guseh JS, Bores SA, Stanger BZ, Zhou Q, Anderson WJ, Melton DA, Rajagopal J (2009). "Notch signaling promotes airway mucous metaplasia and inhibits alveolar development". Development. 136 (10): 1751–1759. doi:10.1242/dev.029249. PMC 2673763. PMID 19369400. ^ Göthert, Joachim R.; Brake, Rachael L.; Smeets, Monique; Dührsen, Ulrich; Begley, C. Glenn; Izon, David J. (2007-11-15). "NOTCH1 pathway activation is an early hallmark of SCL T leukemogenesis". Blood. 110 (10): 3753–3762. doi:10.1182/blood-2006-12-063644. ISSN 0006-4971. PMID 17698635. ^ Weng, Andrew P.; Ferrando, Adolfo A.; Lee, Woojoong; Morris, John P.; Silverman, Lewis B.; Sanchez-Irizarry, Cheryll; Blacklow, Stephen C.; Look, A. Thomas; Aster, Jon C. (2004-10-08). "Activating Mutations of NOTCH1 in Human T Cell Acute Lymphoblastic Leukemia". Science. 306 (5694): 269–271. Bibcode:2004Sci...306..269W. CiteSeerX 10.1.1.459.5126. doi:10.1126/science.1102160. ISSN 0036-8075. PMID 15472075. ^ Palomero, Teresa; Lim, Wei Keat; Odom, Duncan T.; Sulis, Maria Luisa; Real, Pedro J.; Margolin, Adam; Barnes, Kelly C.; O'Neil, Jennifer; Neuberg, Donna (2006-11-28). "NOTCH1 directly regulates c-MYC and activates a feed-forward-loop transcriptional network promoting leukemic cell growth". Proceedings of the National Academy of Sciences. 103 (48): 18261–18266. Bibcode:2006PNAS..10318261P. doi:10.1073/pnas.0606108103. ISSN 0027-8424. PMC 1838740. PMID 17114293. ^ Purow B (2012). Notch inhibition as a promising new approach to cancer therapy. Advances in Experimental Medicine and Biology. 727. pp. 305–19. doi:10.1007/978-1-4614-0899-4_23. ISBN 978-1-4614-0898-7. PMC 3361718. PMID 22399357. ^ Espinoza I, Miele L (Aug 2013). "Notch inhibitors for cancer treatment". Pharmacology & Therapeutics. 139 (2): 95–110. doi:10.1016/j.pharmthera.2013.02.003. PMC 3732476. PMID 23458608. ^ "Notch inhibitors could help overcome therapy resistance in ER-positive breast cancer". 2015. ^ Harmansa, Stefan; Affolter, Markus (2018-01-15). "Protein binders and their applications in developmental biology". Development. 145 (2): dev148874. doi:10.1242/dev.148874. ISSN 0950-1991. PMID 29374062. ^ Themeli, Maria; Sadelain, Michel (2016). "Combinatorial Antigen Targeting: Ideal T-Cell Sensing and Anti-Tumor Response". Trends in Molecular Medicine. 22 (4): 271–273. doi:10.1016/j.molmed.2016.02.009. ISSN 1471-4914. PMC 4994806. PMID 26971630. ^ Sadelain, Michel (2016). "Chimeric antigen receptors: driving immunology towards synthetic biology". Current Opinion in Immunology. 41: 68–76. doi:10.1016/j.coi.2016.06.004. ISSN 0952-7915. PMC 5520666. PMID 27372731.